We’ve re-invented marketing for local businesses. Show your clients how to deliver compelling offers to their best prospects with a total marketing system that can target consumers at home with direct mail, on the Internet, mobile apps and social media. Start getting paid your first month of operation! We’ll help you build a marketing services business that becomes an in-house ad agency resource for neighborhood businesses right where you live. “Hyper-local” strategic advantage, monthly repeat business, integrated media solutions for pennies-per-household. 1. Low, $75K “all in” investment with fast startup, monthly repeat business, 36-year track record of success and record franchisee profitability. 2. “GPS”: New 2-year training, support and launch program provides working capital, no royalties for 2 years and monthly checks starting your first month of operation. 3. Unrivaled training and support includes 4 weeks of expense-paid boot camp following MM University where you work with a team of trainers in an actual sales territory. 4. Compelling strategic advantage – the only national franchise laser-focused on local, neighborhood businesses, one of the most under-served market segments in the County. GPS: Goals, Process, Systems. Your paycheck replacement plan! 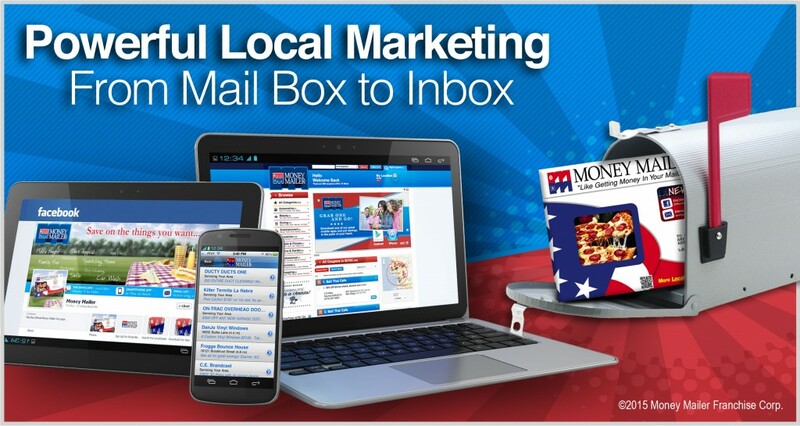 We want your franchise to become an “in house” ad agency resource for local, neighborhood businesses. We’ll provide the training, technology, software and systems-for success! Money Mailer University. You’ll spend one week of intensive classroom curriculum learning how to work with our proprietary technology and web-based marketing tools to scale your operation quickly. “Boot Camp.” Next 4 weeks working with a team of trainers in an actual sales territory, mastering what you learned at MMU, emerging “battle tested” and ready for a successful startup. In-Territory Support. A field-based Regional Sales Manager (RSM) will now work with you to help ensure a successful startup. You will have a dedicated RSM for the entire term of your Agreement! Customer Care Concierge. Your dedicated customer care expert will ensure each mailing runs smoothly and your art center coordinator has a team of graphic designers for all your ad creation. Ongoing Training and Support. From 24/7 access to robust marketing databases to regular field communications meetings to our world-class annual convention nothing is left to chance! You’re a relationship-builder, highly self-motivated, someone with a real passion for helping businesses succeed. You need great communication and people skills and a strong work-ethic. You don’t need sales experience but you do need sales potential because your success comes from providing client value, signing annual agreements and creating monthly repeat business. This is a consultative sales process not a one-call close transaction. Full time only. You will need $75K for the franchise fee plus $25K “liquid” set aside for living expenses. If this $25K is not “in the bank” you will need to provide documentation of access to these funds such as a working spouse or other source of income. We are pre-approved under the SBA Franchise Registry.